Ever wished you had a little more grasp of your favorite game? 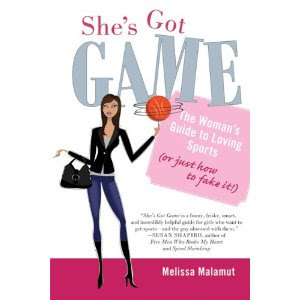 Melissa Malamut has got you covered with her new book, She’s Got Game: The Woman’s Guide to Loving Sports (Or Just How to Fake It!). Malamut not only goes over the basics of football, basketball, baseball, golf and more; but she recommends when to cheer and when to stay quiet (as in when your team is shooting a free throw). She even goes into the best outfits for each sport (basketball with its climate controlled arenas is the best sport to dress up) and the best time to leave your seats for a snack or a bathroom break. Malamut is a veteran journalist and sports reporter. This would be more fun (and less humiliating) than picking up a “Dummy’s Guide” if you’re looking to impress your man before the next big game.